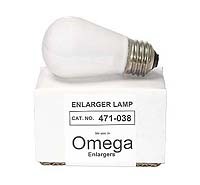 Omega part #471-038 PH140 75watt 120volt "tear-drop shaped" opal enlarging lamp for use in Omega B-66, B-600, C-67, C-700 and C760 condenser enlargers. May also be used in other enlargers where a PH140 enlarging lamp is specified. For lamp information for specific Omega enlargers, please refer to our Omega Enlarger Guide.